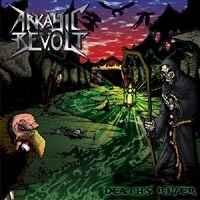 Canadian trio Arkayic Revolt play thrash in a way that breaks no boundaries whatsoever. But they do it with conviction and power, and for that they earn a bunch of points in my book. If you want something to compare their style to, we have to look towards another trio, namely Prong. There are definitely some similarities in the way Arkayic Revolt structure the song as well the tightness. Another band name that comes to my mind when I listen to 'Deaths River' is Atrophy whom some of you might remember. A good quality thrash band who unfortunately never quite made it into the big league, but still made an impression on yours truly and many others. So, if you're looking for a solid thrash band who have something to say, you might want to look in the direction of Arkayic Revolt. Not a bad at all!